As investors, we are always being inundated with offers for the “next big thing” that will generate returns in excess of the overall market. While they may deliver what they promise over the short-term, inevitably reversion to the mean takes hold and that outperformance turns into underperformance. Then there are the investors who look at short-term performance as a primary selection metric. However, many of history’s greatest investors made their money by going against the herd. These investors, oftentimes called contrarians, flee investments that are being propped up by market exuberance and buy up those investments that are being shunned by the herd. The procyclical or trend-chasing allocation accentuates the underlying economic shocks to various investment styles as flows push valuations. In the short run, this results in self-fulfilling prophecy and momentum. In the long run, it becomes self-defeating and gives rise to mean reversion. This investor pattern contributes to a predictive relationship between the valuation multiple and future return. Frazzini and Lamont (2008) and Hsu, Myers, and Whitby (2015) find evidence that mutual fund flows predict negative future fund performance. Fund flow is the net of all cash inflows and outflows in and out of various financial assets, such as stocks, bonds or mutual funds. Investors and market analysts watch fund flows to gauge investor sentiment within specific asset classes, sectors, or for the market as a whole. For example, if net fund flows for bonds funds during a given month is negative by a large amount, this would signal broad-based pessimism over the fixed-income markets. 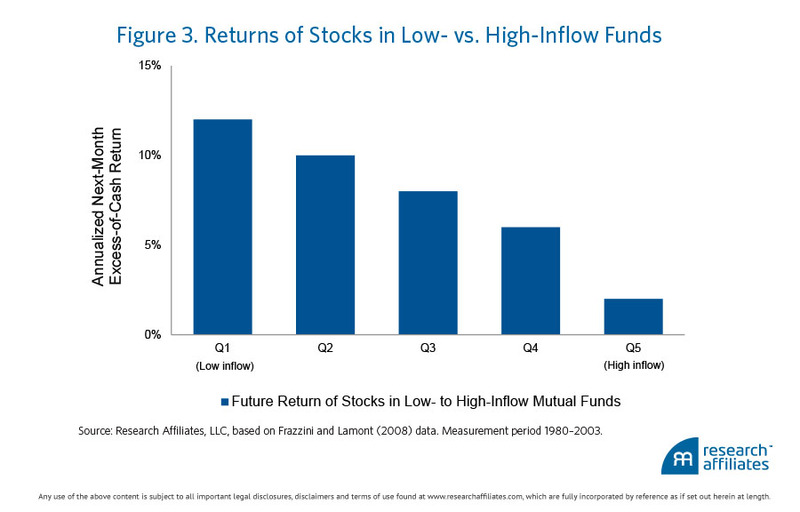 In Figure 3, Hsu shows that mutual funds with high inflows have low next-period relative performance. So what Hsu shows is that the investments where people are flocking to will underperform in subsequent periods while those being shunned by the majority–with negative fund flows–tend to outperform. This research also shows that individuals will hurt their performance by chasing “what’s working now.” While going against the herd can be difficult, especially when the “hot” strategy may still be performing well, the contrarian investor has research and history on his or her side. If you want to become an effective manager of your own assets and achieve your financial goals, consider a risk-free 30-day Trial AAII Membership. As an AAII member you have access to our broad array of educational articles as well as a number of other member benefits.